As an impressionable child in the mid 1960’s, life was fraught with a kaleidoscope of sounds, images and ideology. Curiosity coupled with enthusiasm ignited my desire to ask a lot of questions and look at life as a giant crossword puzzle. I remember many things: duck and cover in the lower floors of the public school for safety drills due to the Cuban Missile Crisis, Coca-Cola vending machines in Miss Lorette’s Dance Studio in Cedarhurst, Long Island, and my piano teacher taking me to see a computer, housed in a glassenclosed room, that was vast and impressive. There were other memories, of course, but one that stands out was the night my grandfather proudly displayed a little plastic card he took from his wallet. On it I could read the words, Carte Blanche. I remember him beaming from ear to ear one Sunday evening at Lundy’s Restaurant in Sheepshead Bay, Brooklyn, while showing it to Simon, our family’s favorite waiter. My Papa Louie explained that he could now go into a restaurant, eat dinner and use this card to pay for the meal. At the end of the month, all the charges, from all the meals, would come on one bill for him to pay. I didn’t really care about the details; I was interested in the words. Carte Blanche. When this month’s assignment for the Happy Herald feature article arrived in my inbox, I realized I was being asked to offer fresh, new and innovative inspiration for the New Year. The January article we are looking for is all about being the best you can be in the New Year, whether it means losing weight, stop smoking, eating healthier or even living out your dreams and whatever else you would like to mention. Truth be told, how many new “to do’s” are there to share? I myself have always said, “There’s nothing new under the sun.” Really, everything we need to do for the New Year we’ve already heard. The new comes from listening, desiring, and taking action. Period. We know about resolutions: lose weight, stop destructive behavior, set new goals, do more good things, and the list goes on. So why not something else? That’s where the idea for Living a Carte Blanche Year came to mind. Carte Blanche, the credit card my grandfather held, relegated him into an elite class of people that had earned the ability to treat themselves well. 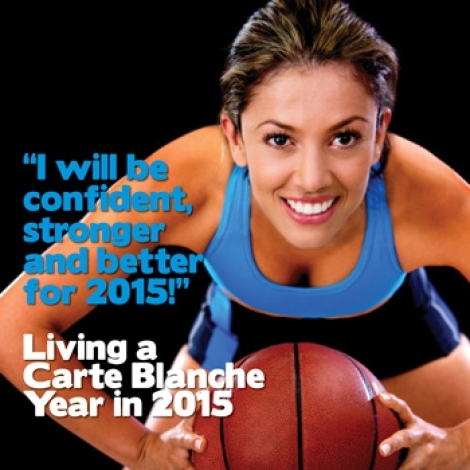 Carte Blanche means to be given full discretionary power. Imagine if you chose 2015 to be the year you give yourself, as I am choosing to give myself, carte blanche, to do things that will make you the Best You Can Be. That includes the practices of self care, kindness, volunteerism, generosity, compassion, personal development, and a bit of fun, play and maybe some extravagance, if you stretch past self-imposed limitations. I´m not going to write a to-do list for 2015, nor will I tell you how to make this year be better for you. I am merely suggesting you make yourself a Carte Blanche card and give yourself the credit to indulge in making you the best you can be!!! Welcome to 2015.